Good thoughts on loosing controllers. Also, no spellchecker on your computer? i have been (and still am) following with a lot of interest the psr-7 implementation of request\response…etc…what is now called http-message. I see a lot of people putting a lot of effort into this, i see a lot of different opinions, i see people changing their minds and embracing the new…some others holding back tight. I also see what i felt when i started using node.js i.e. that php was a little behind and i wanted all the cool features of node into php, and i wanted them “now”. Then sometimes I stop and reflect on what’s going on, because the hunger for new features can make us loose sight of our goals. We are now back thinking of a web application as just something that parse a request and return a response. Indeed a web application is just that. That is 101! But we are starting to forget that we build applications to solve problems. The application problem is not parsing a request and sending a response. The application is more about calculating a result, storing input, in simpler words, development is more about what happens beetween the request and the response. We, those who like to build framework and packages, are not being objective because we think the application being all about request/response. That would be true when the problem is “building a framework”. Managing request and response should be the framework responsibility. Even if i love using middlewares and i find it very elegant (i love connect/express.js), I believe that having all controllers (route handlers) operate as middlewares will distract the developer from the problem it’s trying to solve. 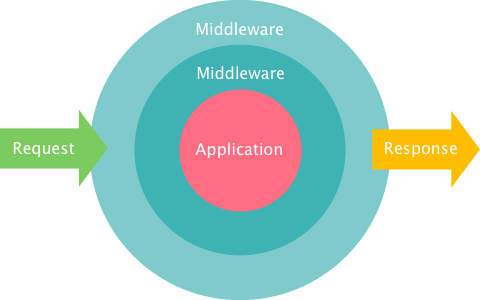 Thinking evertything as a middleware will force us have all development in terms on $request / $response parameters. these look more problem-solving-related to me. An extra issue arises from http-message immutability. Don’t get me wrong, I believe immutability to be a valid point and the way to go, but now every change of state of the response object must be communicated back to the framework (see zf2 example on mvc event setResponse()). So not only we are left with one controller method signature – someAction($request, $response) – for all the problems we are trying to solve, but we also need to be responsible for maintaning synchronized states of the request and response objects. Again, that should be framework developers’ concern and the framework responsibility. Application developers should be concerned with real input parameters, not with their containers. We shoud stop forcing every developer to be a framework developer and provide tools to concentrate on the real application problem. the request/response paradigm does not manage console applications. Many frameworks (Yii/Yii2 as an example) abstracts application input/output so that it can be applied both to console and web applications. Basing everything on http-messages we will loose that further level of abstraction. psr-7 is all about http. So…big news, big enhancements, more interoperability and cool new features ….but also a lot more to think about. Well the PSR-7 Request/Response classes are more designed for communication between arts of system than internal use. E.g. PHPixie is going to have its own Request/Response which wrap around PSR classes. As for your example with listUsers() to me it seems like listUsers($offset, $limit, $sort) is your domain logic and should g into some separate class totally unrelated to controllers/middlwares etc. Then your ListController calls that method and generates a response.